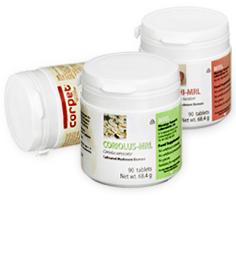 Biomass powder of mycelium and primordia (young fruiting body) of Cordyceps sinensis mushroom. Biomass powder of mycelium and primordia (young fruiting body) of Coriolus versicolor mushroom. Biomass powder of mycelium and primordia (young fruiting body) of Grifola frondosa mushroom. Biomass powder of mycelium and primordia (young fruiting body) of Agaricus blazei mushroom. Biomass powder of mycelium and primordia (young fruiting body) of Ganoderma lucidum mushroom. Biomass powder of mycelium and primordia (young fruiting body) of Hericium erinaceus mushroom. Biomass powder of mycelium and primordia (young fruiting body) of Auricularia auricular mushroom. Biomass powder of mycelium and primordia (young fruiting body) of Pleurotus ostreatus mushroom. Biomass powder of mycelium and primordia (young fruiting body) of Polyporus umbellatus mushroom. Biomass powder of mycelium and primordia (young fruiting body) of Poria cocos mushroom. Biomass powder of mycelium and primordia (young fruiting body) of Lentinula edodes mushroom. Biomass powder of mycelium and primordia (young fruiting body) of Inonotus obliquus mushroom. This cookbook tells the story of two friends merging their individual passion for two of Nature’s nutritional ingredients and offers a collection of recipes for all home-cooks to enjoy. Are you a healthcare practitioner? Have access to special practitioner prices. Get our lastest news and updates.